The California Highway Patrol and Office of Traffic commissioned UC Berkeley to study the safety affects of motorcycles riding between lanes in traffic, and found it adds no explicit danger to motorcycling in general. "What we learned is, if you lane-split in a safe or prudent manner, it is no more dangerous than motorcycling in any other circumstance. If you are speeding or have a wide speed differential (with other traffic), that is where the fatalities came about," Office of Traffic Safety spokesman Chris Cochran told The Sacramento Bee. Basically, cops would like lanesplitting to be reserved for traffic jams. The CHP generally suggests motorcyclists should travel "no more than 10 MPH faster than traffic, and not split lanes at all if traffic is moving at more than 30 MPH." Those rules were actually on the books as of last year, but have since been revoked as they were deemed "illegal regulations." NBC Bay Area says motorcyclists are lanesplitting more now than they have in the past. 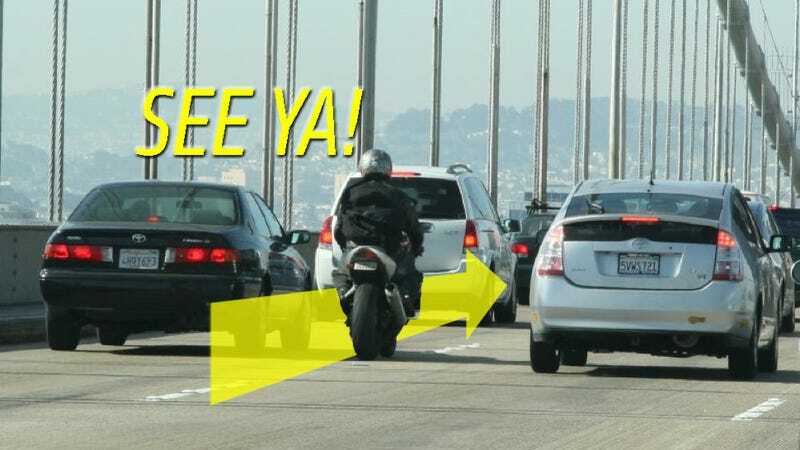 Apparnently another Office of Traffic study said "62 percent of motorcyclists say they lane-split on both freeways and other roads, a 7.5-percentage-point increase over 2013. Seventy-five percent of riders between the ages of 18 and 24 report they lane-split on all roads, including freeways." They went on to say riders are splitting lanes at lower speeds now than they have in the past. Both make sense to me; overall traffic congestion is only increasing. That's going to put more motorcyclists on the road in general, and motivate more to take opportunities to escape traffic when they can.